Email that understands you. Less clutter, more clarity. Connecting me to we. instead of email that makes you work. Guided by analytics, IBM Verse learns your behaviours to adapt to the way you work, wherever you work. 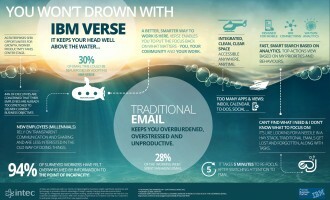 And because IBM Verse is a business email solution, it understands you have special security and privacy needs too. Move to a bright place far beyond the mess of senders, subjects and folders. With built-in intelligence and a user-first, user-tested design, IBM Verse offers a faster, better way to manage business communications across devices, organise inbound and outbound information, and focus on what you need most. Bridge the distance between people and information. A seamless array of social and mobile capabilities delivered from the cloud helps IBM Verse open up intuitive new ways to share valuable information with colleagues, co-workers and customers. It’s never been easier to be mobile, be secure and be connected. Including tracking of actions that need attention, analytics based identification of important people and content, in depth search, in line preview of attachments and Connections Files, team analytics services, support for mail threads, and entitlement to IBM Notes client (includes software download). 50 gigabytes of mail box storage allocated for each IBM SaaS user. Ability to upload, store, and share personal files up to 30 gigabytes.